I've had a love affair with Pistachio Muffins for a few years now. Every time I go home to visit my mom, I have get the pistachio muffins from Shoprite. Usually when I like something, I get the recipe and learn to make it myself. I'm not sure what took me so long this time but here it is. I love that green stuff! 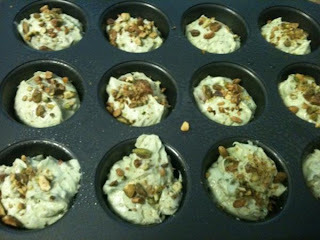 1/2 cup pistachios, coarsely choppedPreheat the oven to 425 degrees and grease muffin pan. Combine the dry ingredients including the zest and finely chopped pistachios in a large bowl. Cream the butter and sugar together on lowest setting on your mixer and beat eggs in one at a time until light and fluffy. Add the vanilla and rum extracts. Starting with about 1/3 of the dry mixture, alternately add part of the dry ingredients and the milk, briefly mixing after each addition. Scoop the batter into the prepared tin using an ice cream scoop. Sprinkle the tops with the coarsely chopped pistachios. Place the muffins in the oven and immediately turn the temperature down to 375 degrees. Bake for 18 minutes or until the muffins test done. After the muffins have cooled, remove them from the tins to cool on a wire rack. I already saved this recipe. It looks delicious. Thanks for sharing.